Technicians attend a rehearsal of the show Universal Judgment: Michelangelo and the Secrets of the Sistine Chapel, directed by Marco Balich, on March 13 near the Vatican. The Vatican Museums, which house the Sistine Chapel, provided high-definition digital reproductions of the frescoes in the hall at a reduced rate because they acknowledged the educational value of the project. Journalists view scenes from the show in Rome on March 12. Marco Balich is the artistic director of the show. Universal Judgment: Michelangelo and the Secrets of the Sistine Chapel includes a variety of visual effects. One of Rome's must-see sights is the Vatican's Sistine Chapel — but it's usually so packed, visitors have a hard time absorbing the majesty and beauty of the frescoes painted by Michelangelo. 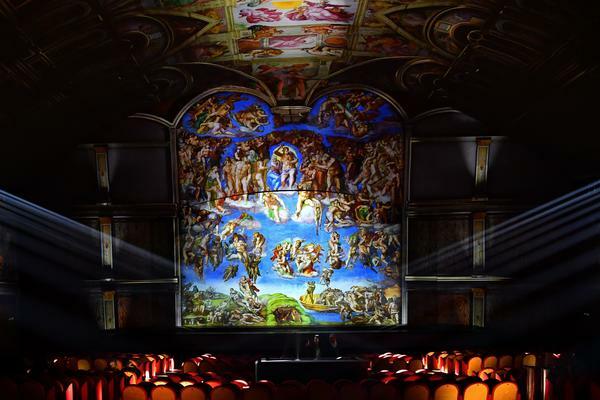 Now there's a new spectacle in town, where visitors can sit comfortably in plush theater seats and feast their eyes on every detail of the Sistine's masterpieces. On a Saturday afternoon in April, the Auditorium della Conciliazione just off St. Peter's Square was packed with families and teenagers. They came to see Universal Judgment: Michelangelo and the Secrets of the Sistine Chapel — a surround-sound show with live performances by actors, dancers and acrobats, orchestral music and high-definition projections that highlight the Renaissance master's depiction of Genesis and the Last Judgment. 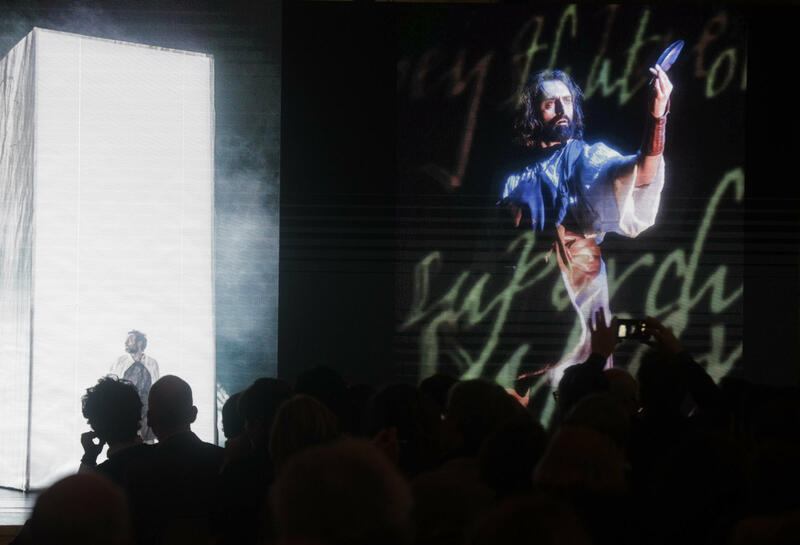 The spectacle brings the audience right into the chapel and up-close, as the iconic image of God's outstretched finger is about to give life to Adam. "We need to inspire the younger generation about beauty and culture with their own language," says Marco Balich, who has applied his know-how as director of many Olympic ceremonies to the high-tech Sistine spectacle, his brainchild. 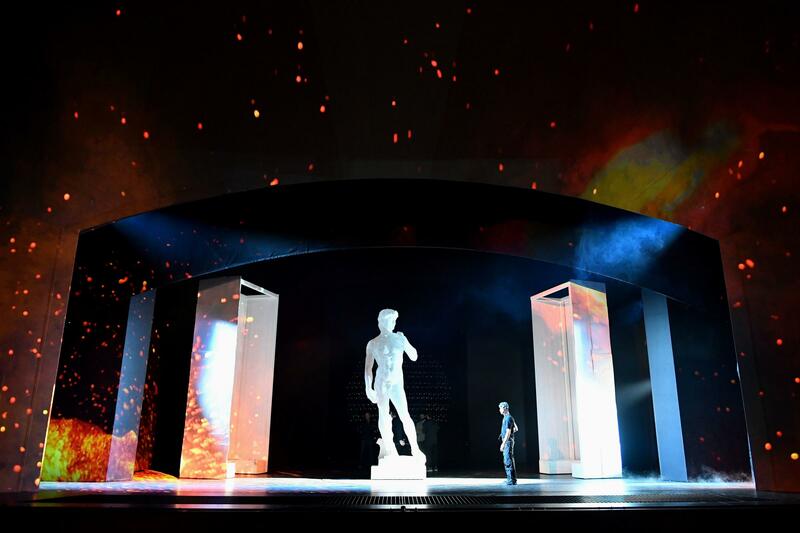 The show is one hour long — young people's maximum attention span in the era of social media, says Balich — and it uses high-definition projections of Michelangelo's frescoes. "We project on the roof, we project on the sides, we project in front," says Balich, "we have actors coming from all over, we have people flying, we try to convey important messages delivered in a very, very understandable way." There are only 16 minutes of narration explaining how, in 1508, Michelangelo the sculptor — with no experience with fresco painting — was summoned by Pope Julius II to paint the chapel ceiling. The artist carried out the feat — covering 10,000 square feet of ceiling in just 500 days of work. And then, over 20 years later, Pope Clement VII called him back to paint the grandiose Last Judgment above the chapel altar. To help explain how the ceiling frescoes illustrate the biblical creation of the world, a recording of actress Susan Sarandon is heard reciting parts of Genesis: "In the beginning, God created the heaven and the earth. ... And God said, let their be light, and there was light. And God saw the light, and it was good." Balich says, "I wanted to have the voice of God to be a woman." The Vatican Museums — which oversee the Sistine Chapel — gave the show its imprimatur by providing the high-definition digital images of the frescoes. "The Vatican Museums are based on the concept of tradition and innovation. This project is something special, of important historical and artistic value," says the museum's director, Barbara Jatta. "We also ensured no historical or artistic errors were made." Balich chuckles as he recalls meetings between Vatican art historians and top video game producers, "people with all sorts of tattoos and earrings and stuff, meeting with these very diligent and proper experts. How to connect the two worlds, ultimately what I was trying to do." The finale offers more star power — a contemporary take on 13th century sacred music produced and sung in Latin by Sting. The work was recorded in London with an 18-piece choir. In remarks for the press conference before the show's March 15 premiere, the pop singer said he was well schooled in the music of the Church as a child, "and this was an opportunity to reacquaint myself with the sacred music that had such a powerful influence on my life and work as a musician." But, he added, he was surprised his composition would be chosen for the dramatic finale of the Sistine show. While some Italian critics panned it as "Disney-fication" of culture, many in the audience were moved by the show. Leaving the auditorium at a recent performance, Pete Stevens, from Birmingham, England, said the show taught him a lot. "To hear the story of each particular piece of artwork and have that put together with the dance, the performance and the immersive experience is wonderful, wonderful," he said. Maria Grazia Parta — a Roman teenager who has visited the real Sistine Chapel — could not hide her emotion. "Maybe it's the most beautiful thing that I've ever seen in my life, really," she said. "It's very important for me watching this and taking part in this event." The production is expected to run at least one year. Talks are also underway for bookings elsewhere in Europe and Latin America. One of Rome's must-see sites, the Vatican's Sistine Chapel, is usually so packed that visitors have a hard time taking in the beauty of the frescoes painted by Michelangelo. Now, as NPR's Sylvia Poggioli reports, there's a new way to absorb all these Sistine Chapel masterpieces from the comfort of plush theater seating. SYLVIA POGGIOLI, BYLINE: The auditorium just off St. Peter's Square is packed with families and lots of teenagers. They've come to see "Michelangelo And The Secrets Of The Sistine Chapel," a surround-sound live show that highlights the Renaissance master's depiction of Genesis and the Last Judgment. The spectacle brings the audience right into the chapel and up close as the iconic image of God's outstretched finger is about to give life to Adam. MARCO BALICH: We need to inspire younger generation about beauty and culture with their own language. 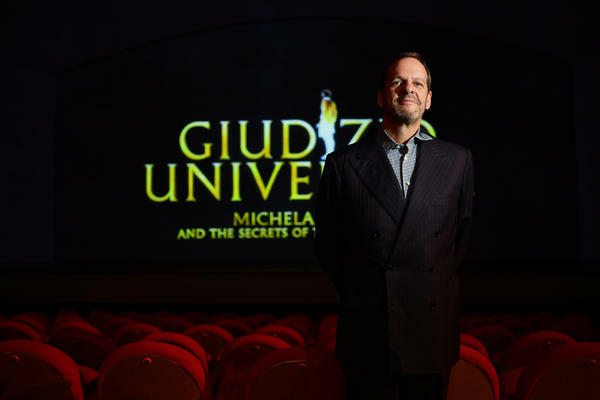 POGGIOLI: The show is the brainchild of Marco Balich, who has applied his know-how as director of many Olympic ceremonies. The show is one hour long, young people's maximum attention span in the era of social media, says Balich. And it uses high-definition projections of Michelangelo's frescoes. BALICH: We project on the roof. We project on the sides. We project in front. We have actors coming from all over. 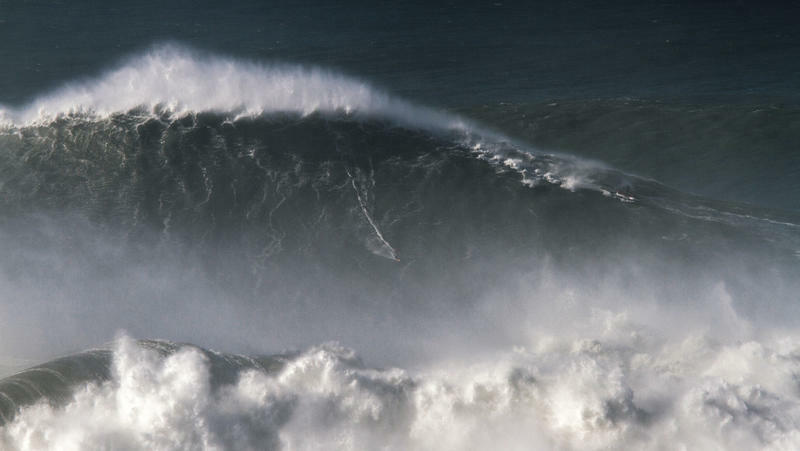 We have people flying. We try to convey important messages delivered in a very, very understandable way. To help explain how the frescoes illustrate the biblical creation of the world, there are readings from Genesis. SUSAN SARANDON: (Reading) In the beginning, God created the heaven and the earth. And God said, let there be light, and there was light. And God saw the light, and it was good. POGGIOLI: Balich explains why he chose actress Susan Sarandon. BALICH: Well, I wanted to have the voice of God to be a woman. POGGIOLI: Vatican Museums gave the show their imprimatur, providing the high-definition projections of the frescoes and experts who closely followed the production to ensure no historical or artistic errors were made. Balich chuckles as he recalls meetings between Vatican art historians and top video game producers. BALICH: People with all sorts of tattoos and earrings and stuff meeting with these very diligent and proper (laughter) experts. And so that was how to connect the two worlds. And that is ultimately what I was trying to do. POGGIOLI: The finale offers more star power, a contemporary take on 13th-century sacred music produced and sung in Latin by Sting. POGGIOLI: Leaving the auditorium, Pete Stevens from Birmingham, England, says the show taught him a lot. PETE STEVENS: To hear the story of each particular piece of artwork and then to have that put together with the dance and the performance and the immersive experience is wonderful - wonderful. POGGIOLI: Maria Grazia Parta, a Roman teenager who has visited the real Sistine Chapel, can't hide her emotion. MARIA GRAZIA PARTA: Maybe it's the most beautiful thing that I've ever seen in my life, really. It's very important for me, watching this and taking part of this event. POGGIOLI: The show runs in Rome until next March. Talks are underway for bookings elsewhere in Europe and Latin America. POGGIOLI: Sylvia Poggioli, NPR News, Rome. Transcript provided by NPR, Copyright NPR. There are rescue dogs, saved from abusive owners and placed in loving homes. Then there is Payo. 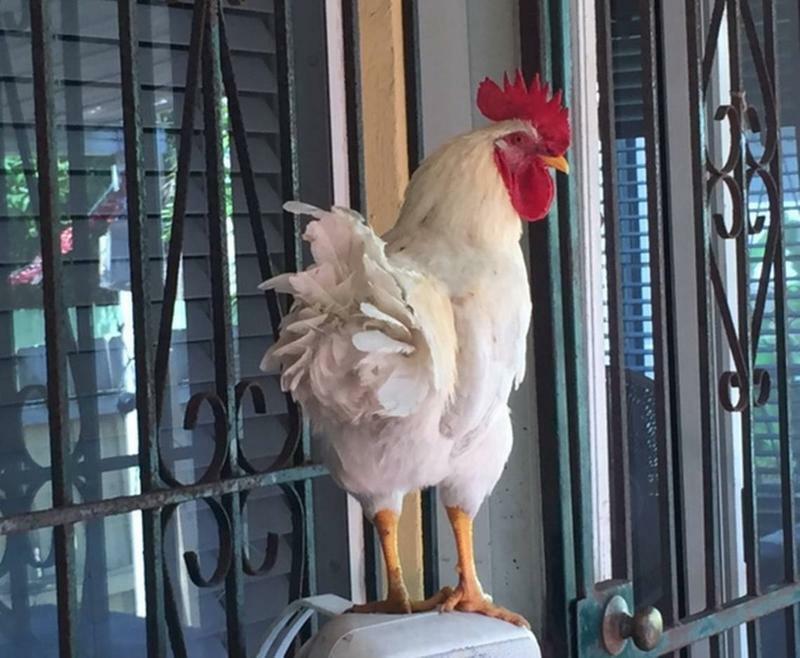 He is a rescue rooster. He was doomed to die in a Santería ceremony. Just as his neck was to be slit, Payo’s adoptive family swooped in. They persuaded the priest to sacrifice another animal. They brought Payo home and set him free in the back yard. And this is where the sweet story of the pet rooster ends. Because sleep-deprived neighbors don’t call the big white bird with the blood red eyes by his nickname. They call him El terrorista. The terrorist. Anyone who has ever owned a dog – or any pet, for that matter – can tell you how difficult that last day is. 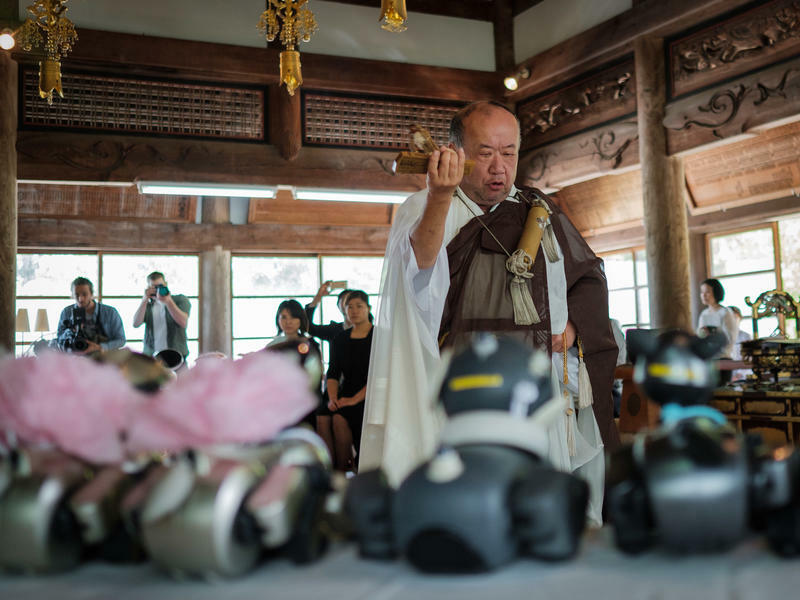 And so it must have been for the owners of 114 Sony Aibo robotic dogs whose beloved pets were given a Buddhist send-off last week at a ceremony at Japan's 450-year-old Kofukuji Temple.